On the anniversary of the I35W bridge collapse, I still wonder if Minnesota collectively learned the lessons that will help us prevent future infrastructure disasters. I’m just not sure the news media was at its best on this story, as former Star Tribune columnist Nick Coleman points out today on his blog. The Star Tribune’s Tony Kennedy did uncover photos of the bent gusset in the investigation file, and that was some terrific journalism. But that story begged for important follow-up questions that I’m not sure ever were posed. The questions I had on November 14, 2008 when the National Transportation Safety Board (NTSB) came out with its final report are the same questions I have today. And four years later, I worry that a smaller group of news reporters has even less capacity to investigate such complex stories than it had then. U See U10, U Fix U10? The National Transportation Safety Board (NTSB) has concluded that the I35W bridge collapse was caused by undersized gusset plates and oversized construction load, and that corrosion did not cause the collapse. I’m as far from an engineer as you can get, but all of that makes logical sense to me. But it strikes me that the NTSB made an error of ommission. It failed to explore why no steps were taken to address a gusset plate that was known to be badly warped, more than four years before the collapse. 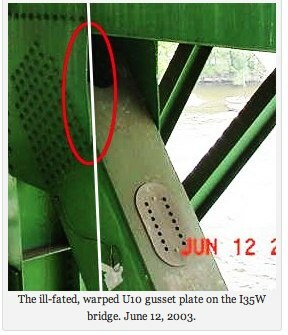 Some terrific investigative reporters at the Star Tribune discovered that Minnesota Department of Transportation (MnDOT) bridge inspectors had a June 12, 2003 photo of a very warped U10 gusset plate in their inspection file. U10 is the plate that NTSB says failed. That part of the process seemed to work well, and we should be comforted by that. Inspectors spotted and documented a major problem. But then what? Did the inspector report the problem to superiors? Did the inspectors’ superiors discuss options for strengthening the warped plate? If strengthening or replacing was technically infeasible, did MnDOT consider closing the bridge, as they have in the face of similar problems in St. Cloud and Hastings? Assuming the plate couldn’t be fixed, why didn’t someone at least warn against parking several tons of construction equipment — reportedly the largest load the bridge had ever borne, equal to the weight of a 747 jet — directly on top of the badly warped U10 gusset? These are legitimate questions that the NTSB seems to have bypassed. Think of it this way. Imagine if a doctor spotted a tumor, stuck a PET scan of it in the file, labeled the tumor an unfortunate biological design flaw, and took no further action to prevent further damage from the flaw. The doctor would be 100% correct; the tumor is a design flaw, and not her fault. But the doctor would still need to explore all options for removing, killing or slowing the tumor. And so it goes with MnDOT. The NTSB seems to have done excellent work examining the strictly technical issues behind the collapse. But for whatever reason, it stopped short of delving into the human and process issues. I have no interest in villifying MnDOT. They do amazing work that keeps us safe, and keeps our society and economy humming along. I just want to see a great agency get better. There was a gap between inspectors seeing the flawed U10 gusset plate and MnDOT doing anything about it. To prevent future catastrophes, NTSB needs to help us understand the reasons for that gap. The ill-fated, warped U10 gusset plate on the I35W bridge. June 12, 2003. The National Transportation Safety Board (NTSB) told the media yesterday that the I35W bridge collapse was due to faulty gusset plates and heavy maintenance equipment on the bridge. Period. Investigators say nearly 300 tons of construction materials on the bridge “played a role” in the tragedy and there is “no basis” to believe corrosion or other maintenance issues were a factor, according to internal NTSB deliberations. I’m not convinced when it comes to “other maintenance issues.” If it is true that there was evidence in the file four years prior to the collapse that bridge gusset plates were bent, as the Strib asserted this weekend with some pretty compelling photographic evidence, the NTSB’s conclusions are dangerously incomplete. Those photos in the file appear to be evidence of two things 1) faulty plates and 2) safety inspectors’ failure to identify and/or address faulty plates. When it comes to important lessons moving forward, the latter finding is every bit as relevant as the former. The NTSB needs to determine why the warped gusset plate photographs were not acted on. What they learn could increase the chance that future inspectors will handle the situation the way they are with the St. Cloud bridge in 2008 (i.e. closing it down when they see signs of danger), rather than how they seem to have handled it with the Minneapolis bridge when they enountered the warped gusset plate photos back in 2003. This investigation is dispiriting. The NTSB, Legislature, MnDOT and Governor should be learning, not blaming or spinning. The Star Tribune’s Tony Kennedy deserves some love for his story pointing out the bent I35W bridge gusset plates in photos that apparently were in the hands of the Minnesota Department of Transportation (MnDOT) five years prior to the I35W bridge collapse. 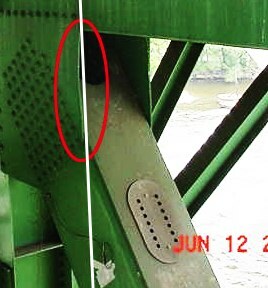 The fact that these bent gusset plate photos were in state officials’ hands in 2005 seems to suggest that the bridge safety inspection could have been better. Journalists have more digging to do, because we need to know what happened with these photos. Did inspectors not see the bending? Did they see them, but conclude it wasn’t a serious problem? Did inspectors conclude it was serious problem, but conclude that all potential fixes were more dangerous than the problem itself? Or did the safety inspectors recommend a solution that was shot down higher up the food chain? If so, did the leadership forgo repairs because of technical concerns or budgetary concerns? For me, this kind of dispassionate questioning isn’t about blaming Pawlenty, Molnau or committed MnDOT employees. This is about learning from any mistakes, so we can build a better safety oversight system that keeps Minnesota bridges upright in the future. The rest of us don’t have the time to schlep through hundreds of photos with straight edge rulers up against gusset plates. I’m grateful at least one newsroom in town does.